Let’s talk sun damage, people. Nothing beats a fruity drink at a sandy beach on a sunny day, but the sun’s got a dark side. The sun wreaks havoc on your skin and on your body. A nasty sunburn can hurt for days, but the damaging effects from a sunburn can last a lifetime. First off, sun damage can cause cancer. Thats right, the C-word! UV radiation damages your DNA within your skin’s cells. If your skin is repeatedly exposed to UV radiation, your skin’s cells can begin multiplying out of control which leads to skin cancer. Second off, the sun is the number one cause of premature aging, I.E. Photoaging. The harmful UVA rays of the sun penetrate the dermis, which is the outer layer of your skin. As a reaction to these harmful rays, the skin then begins to produce collagen abnormally. This process causes your remaining collagen to decompose at a faster rate. Scary, right? After age 20 we create 1% less collagen every year. And so we can use all the collagen we can get! That means taking measures to protect ourselves and prevent sun damage. Sunscreen, Sunscreen, Sunscreen! It cannot be said enough. Sunscreen is crucial to fighting the signs of Sun Damage. Dermaquest makes an amazing Sheer Zinc SPF 30 which goes on light and can be worn with or without make up. This sunscreen is a physical sunscreen. And so it protects the skin from both UVA and UVB rays and is effective immediately. Physical sunscreen lasts longer than chemical sunscreens, giving you more protection. And unlike harsh chemical sunscreens, Dermaquest’s Sheer Zinc SPF 30 won’t irritate your skin or clog your pores, making it the perfect sunscreen for sensitive skin. Now that we’ve talked prevention, lets talk remedies. Vitamin C is a great place to start if you’re looking for help for your sun damaged skin. Vitamin C encourages cell growth while fighting free radicals (collagens arch enemy!) It also is great at fighting against the enzyme tyrosinase which is what causes pigmentation in the skin (dark spots!). Dtox Day Spa offers a great Vitamin C facial that your skin will thank you for. 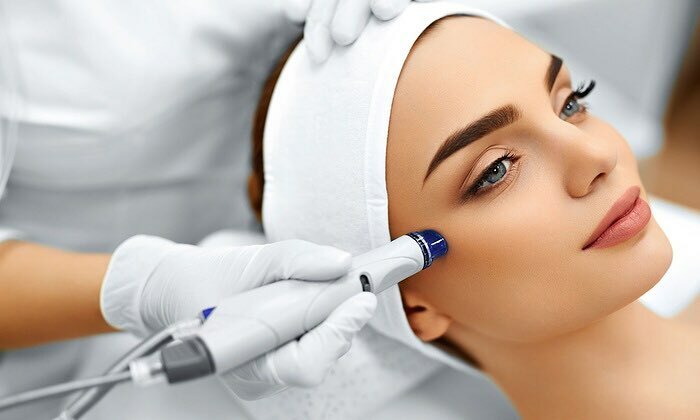 Microdermabrasion is another helpful skin treatment that will take years off of sun damaged skin. Microdermabrasion exfoliates the dead skin cells off, exposing new healthy skin cells which can soak up nutrients more effectively. Through the exfoliation, microdermabrasion breaks up darkly pigmented spots on your skin caused by sun damage. Getting the treatment regularly can revitalize your skin! So go out there, drink your fruity drink on that sunny beach! But don’t forget your big hat and physical sunscreen! And give your skin the help it needs to heal!